Directions for use: For nasal use. 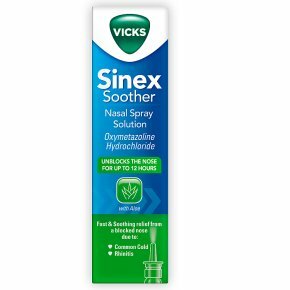 Vicks Sinex Soother should not be used by children under 12 years of age. Keep out of reach and sight of children. The preparation should not be used for longer than 5-7 days in a row. Adults andchildren over 12 years: 1-2 sprays per nostril maximum 2-3 times daily. Consult your doctor or pharmacist if:<br>You feel worse or do not feel better after 3 days.<br>You develop new symptoms.<br>Read the package leaflet before use.